A lot of our Catskills landscape is owned by the New York City reservoir system and is administered by the city’s Department of Environmental Protection (DEP). You can pretty much always tell where these lands are; the roadsides are festooned with no admittance signs. They will let you in if you have a proper fishing permit but, if you don’t, they will chase you away. I should know! But, even if most of us cannot get in, not everything is out of sight. One good example is Manorkill Falls. It’s located on DEP property, but it is still visible from the highway (Schoharie County 39, AKA the Prattsville Road). A highway bridge crosses the Manor Kill itself and you can park, walk out on it and see the falls. The upper falls are visible on the upstream side and, just below the bridge, and almost out of sight, are the lower falls. The local stratigraphy accounts for the two falls, or so it would seem. They tumble over sturdy and resistant sandstone ledges. But, when I visited, I thought there must be more to it than that. I looked at the upper falls, then crossed the road, looked down and to the west. I pondered the origins of these falls. When a scientist is faced with a problem and spends some time thinking about it, then he or she is likely to come up with possible solutions. We call these potential solutions “hypotheses.” That’s a fancy name for educated guessing, but it is an important step in the “scientific method” of problem solving. Off to the west was the Schoharie Reservoir and it lies quite some distance below the falls. I wondered about that as I began to do some serious hypothesizing. I knew that there had once, long ago, been a sizable glacier down there. In my mind’s eye I could see it. It had slowly advanced south from the Mohawk River Valley and filled the entire Schoharie Creek valley, passing through Middleburgh and Blenheim. From there it would continue past Prattsville, almost reaching Hunter. That’s a lot of ice and a big glacier. I was watching it passing north to south, which was my right to left. What a vision I witnessed! The glacier was mostly gray except where fresh snow lay. It was fractured by great curved crevasses, all of them reflecting the stresses that build up within brittle ice as it moves forward. Above it, the hills were bare; there were no forests in this ice age vista. My vision was a brief one, when I looked again, it was autumn and the season’s dense foliage displayed its rich leaf colors. It was the very same view but at a very different moment in time. Geologists are such sightseers! This large Schoharie Valley glacier would certainly have been a very erosive phenomenon. It must have, as it advanced, cut into the Schoharie Valley floor, deepening it and widening it. I realized that this would give me some more help in my effort to explain Manorkill Falls. I looked west once again and, in my mind’s eye, I watched that glacier more carefully, as it slowly passed before me. It was, indeed, erosive and it did work to carve the sizable valley that eventually would form the basin of the Schoharie Reservoir. As such a glacial valley, it was, in fact, steep walled and deep. That helped me some more. I looked to the west and saw that deep valley under the waters of the modern reservoir. Then I turned east again, returned into the past, and saw a post ice age stream emerging from that direction. That stream would have been forced to tumble down the steep valley walls to get to the bottom of old Schoharie Creek Valley. I was looking at the earliest origins of Manorkill Falls. Now I put together a more complete story. That Schoharie glacier had first advanced down the valley. It deepened and widened it, but mostly made its slopes steep. The ice filled the valley for a very long time but, eventually, the climate warmed and the ice began to melt back to the north. A sizable lake replaced the glacier. Its waters filled the valley, matching in so many ways the view of the reservoir, the one we see in modern times. That old lake must have been ten time larger than the modern reservoir! It was about then that Manorkill Creek came to be born. That creek began to flow out of the valley to the east and it was forced to tumble down the newly formed steep slopes of the greater valley. 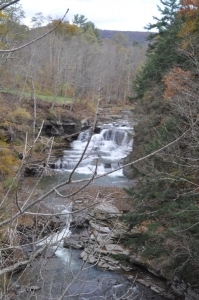 Today’s canyon, behind Manorkill Falls, is deep and speaks of a very strong flow of water, way back then. You can see it as you drive east toward Conesville on Rte. 990 V. I pulled over and got out. I watched, and felt, the flow rising in this canyon. Soon it was a far more powerful and even thunderous flow than we see today. Raging, foaming, pounding torrents raced by. Below all that whitewater, the flow was carving the modern canyon. I, the geologist, had been privileged to go and see its birth. You can go there and do the same.